The Laneway Market is as its name describes. Situated in a laneway just off the busy and narrow road of Tanjong Katong Road, where parking can be a tedious job. If you have been to the east of Singapore, and specifically Tanjong Katong, it is almost like another food haven, where cafes and restaurants sprouts all over and definitely, residents around need not worry about starving. Limited seating, thus reservation is very much appreciated though you still have to wait for the next empty table, instead of having one made ready before your appointed arrival time. Menu is well-thought for diners who have preferences for brunch, mains and also healthier eating. Each section has less than 10 selections, but their forte seems to be in coffee drinks. Sea Salt Chocolate ($6.00). Taste like a normal iced chocolate with the addition of sea salt that requires you to stir well, else the salty chocolate drink might just not make it. Spam fries, truffle mayo ($9.00). Thickly-cut fries, and is pretty crispy on the outside, but for the portion and with the price paid, I believe The Laneway Market can be more generous with the serving. But that one special thing that caught my attention was the truffle mayo to dip with the fries. Usually would be just truffle fries. Laneway Carbonara, Bacon, Chipolatas, Sous Vide Egg ($15.00). I love this, because of the yolk-y sauce on the carbonara after you mixed it up. 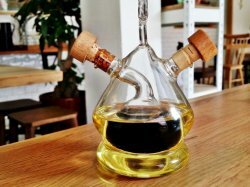 The yolk is not as strong as when you ate the quarter-cooked egg in hawker centres or Ya Kun etc., and blend it with white pepper and soy sauce. I simply scoop up every sauce I can with my carbonara, as the creamy style is just what I liked about. Herb Chicken, truffle mash, mushrooms, roasted carrots, pickled cucumbers ($17.00). The herb chicken is worth having as it has kind of like a juicy meat and well-roasted skin. But the sauce has a mixture of both sour and sweet which then failed to coax me into dipping my chips with it. I felt that The Laneway Market is shorthanded in terms of its crew, as there were only 2 of them serving and scrambling in quick pace all over, from table cleaning, food ordering, serving and also settling payment. Although another pair of helpful hands seems very much in need. Hers: Smoked salmon with scrambled eggs and focaccia, while decorated with sautéed mushrooms. Accompanying her meal was pot of fragrant English tea. Coffee ($5.5), though a little pricey but was worth the price. It had a medium body, was bold in flavour and had a tinge of buttery note. Well, that's how I perceived it. Good cuppa for brunch! Opened by chef Christopher Tan, formerly of Kreme Couture, in December 2014, The Laneway Market is a bright, cheery, yet cozy place, serving hearty and modern fusion food. Named for being situated along a small lane in Tanjong Katong, The Laneway Market has a small but simple menu, but promises a good quality meal each time. Ambience at The Laneway Market is rustic and cozy, and its wooden furniture and white walls offset by checkered patterns lend a relaxing, countryside feel. 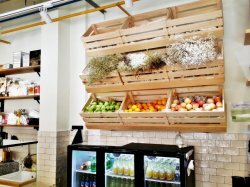 The counter is a bright burst of colour with fruits in crates and flower arrangements stacked on the walls, resembling a weekend farmer's / grocer's market in the European countryside. Service at The Laneway Market front-of-house is overseen by mom Karen, while chef Christopher heads up the kitchen. Staff are friendly and look cheerful, and overall service is rather casual and down to earth. They're able to make recommendations, but as the menu is rather small, and descriptions are provided, this is a simple task. I like that they were able to take requests for coffee art though. Food at The Laneway Market is plated and designed like familiar comfort food, but usually incorporates a twist on ingredients. Chef Christopher experiments with fusion dishes, combining Western and Asian ingredients, producing wonderfully delicious plates of food. Portions are nicely sized for 1 person, and prices are typical of a cafe, budget about SGD $24 per person for a meal here. 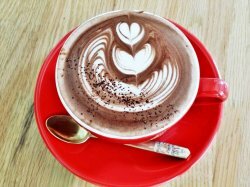 The Sea Salt Chocolate (SGD $6) has that deep, rich, thick flavour of good quality hot chocolate, cut through with the savoury, salty taste of sea salt. Well balanced without being overwhelmingly sweet or salty, and you can taste the distinct layers. Good! 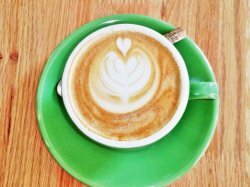 The Laneway Cuppa (SGD $6) is a unique brew of robust coffee, flavoured with coconut. The result is complex, you get the strong, roast aroma of the coffee beans, followed by the earthy, nutty fragrance of the coconut. Novel idea, worth trying! 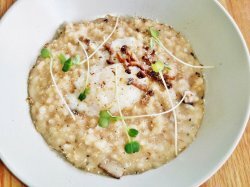 Absolutely loved the Bacon Infused Dashi Risotto, Mushrooms, Sous Vide Eggs (SGD $17)! 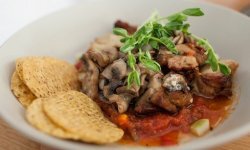 The risotto rice has an earthy, fragrant aroma and taste, with a hint of smoky saltiness from the use of bacon and mushrooms. The rice has absorbed the dashi / seaweed stock well, and is an absolute delight to eat, so addictive! Texture is just right too, slight softness but mostly al-dente with some bite, not mushy at all, very easy to consume. Highly recommended!